Conservative News Sources reports on news from a conservative perspective around the world. Who Will Win the 2012 Presidential Debates? In your opinion, who will win the 2012 presidential debates? If you ask anyone at CNN, they will tell you that Obama already has this election wrapped up. CNN recently conducted a poll asking their readers who they think will win the first presidential debate October 3, and not surprisingly, their readers believe Obama is going to win the debates. 59% of people in their survey believe Obama is likely to do better than Romney in the debates, while another 34% believe that Romney can win these debates. More on who will win the 2012 presidential debates! These numbers don’t make any sense. Romney has recent debate experience. He has extensive debate experience from his time running in the Republican primaries, and if he didn’t know how to debate, he would not have won the Republican nomination. 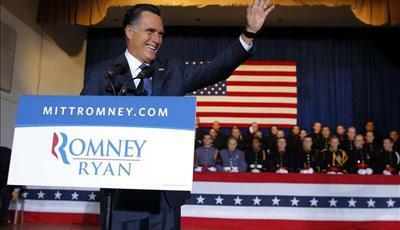 The facts suggest that Romney has an excellent chance to win the presidential debates. The first debate is supposed to focus on economic issues, and President Obama is especially vulnerable in this area. Unemployment rates are up since 2008. The President rejected the Keystone XL Pipeline, and this could have created millions of jobs for Americans. Major defense cuts that are going to take effect at the beginning of 2013 could lay off up to 2.14 million American workers. This number includes people who work directly for the Federal Government, as well as private contractors who have contracts with the defense department who will be out of work too if the Federal Government lays off their other workers. Mitt Romney should also focus on the looming new taxes that are set to begin January 1. Sure, the Bush-era tax cuts are set to expire, but then there are all of the new Obamacare taxes too. The Supreme Court ruled that Obamacare is constitutional simply because it is indeed a tax, so Romney can go after Obama on this. It has been estimated that the average American family will be paying thousands of dollars per year in additional taxes, and Romney has failed to go after Obama on these issues. Since Romney should bring up Obamacare and the coinciding taxes in the debates, he can talk about the new healthcare law too. Polls still show that a majority of Americans oppose the new healthcare law, and voting for Romney gives Americans one last chance to overturn the legislation. Mitt Romney has not addressed Obamacare as often as expected, and he could win more votes by simply reminding Americans that he will push to repeal Obamacare if he is elected President of the United States. While some people believe he will push to repeal the new healthcare laws, many conservatives already believe it is too late to make a difference. Romney needs to tell his base again that he will make the sacrifices that are needed to make the United States a great country again. Lastly, Romney needs to try to dispel the notion among liberals that the economy is growing again. Statistics suggest otherwise, but most liberals actually believe the economy is improving. This could not be any further from the truth. The statistics clearly show that the economy is barely growing, and we may actually be entering a double dip recession.